The grey squirrel was introduced to Great Britain in the mid-19th century. There is now an estimated population of 2 million making them much more common than the native red squirrel. Distribution: Native to North America. Introduced to Great Britain, Ireland and South Africa. Habitat: Prefers mature deciduous woodland but also common in parks and gardens in towns and cities. Description: Winter fur is dense and silvery grey with a brown tinge along the middle of the back. Summer fur is yellowish-brown. White underparts. Bushy, grey tail. Ears without tufts. Size: Head and body about 25 - 30cm; tail about 20 - 25cm. Weight: 350-600g. Life-span: Some live up to 10 years in the wild although most only manage 3-4 years. Food: Hazelnuts, acorns, beech mast, tree bark, fungi, buds, leaves, shoots, flowers; will also raid birds' nests for eggs and young. Population: The grey squirrel was introduced to Great Britain in the mid-19th century and after many releases it began to increase dramatically at the beginning of the 20th century, mainly spreading from Woburn Park, Bedfordshire. They came to England from North America and are now one of Britain's most well-known and frequently seen mammals, with an estimated population of 2 million. They are much more common than the native red squirrel, which has a population estimated at 161,000. The grey squirrel is diurnal and most active at dawn and dusk, searching for available food. Compared with the red squirrel, it spends more time foraging and feeding on the ground than in the trees. It is, however, very agile in the trees and can run along slender twigs, leaping from tree to tree. The long, muscular hind legs and short front legs help it to leap. The hind feet, longer than the front, are double-jointed to help the squirrel scramble head first up and down the tree trunk. Sharp claws are useful for gripping bark and the tail helps the squirrel to balance. If a squirrel should fall, it can land safely from heights of about 9m (30ft). The grey squirrel can leap more than 6 metres! Squirrels have good eyesight and often sit upright on a vantage point to look around them. They have a keen sense of smell too! The grey squirrel builds itself a nest, or drey, about the size of a football, made of twigs, often with the leaves still attached. It is built fairly high in a tree and lined with dry grass, shredded bark, moss and feathers. A summer drey is usually quite flimsy and lodged among small branches. 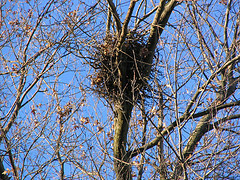 Sometimes the squirrel may make its nest in a hollow trunk or take over a rook's nest, constructing a roof for it. A squirrel may build several dreys. Although grey squirrels have a wide range of calls, they communicate mainly through their tails, using them as a signalling device; they twitch their tails if they are uneasy or suspicious. Regular routes are scent-marked with urine and glandular secretions. Squirrels identify each other, and food, by smell. The grey squirrel does not hibernate and it cannot store enough energy to survive for long periods without food. A larger, thicker winter drey is built, usually on a strong branch close to the trunk, and a squirrel will lie up in this in very cold weather, coming out now and then to search out hidden stores of food. These stores of single nuts and other items are buried in the ground in autumn, well spread out. They are found by smell, rather than memory. Often they are not found at all and later may grow, helping the dispersal of trees. Winter dreys are often shared for warmth. As it sleeps, the squirrel curls its tail around its body to act as a blanket. In late winter, squirrels may be seen courting, one, or more, chattering males chasing a female through the tree or across the ground. Females can mate only twice a year, but males may mate at any time. After mating, the male plays no part in the rearing of his young. The female uses a winter drey as a maternity nest, or builds a new one. She lines it with soft material and gives birth after a six week gestation period (time between mating and birth), in March/April and perhaps again in June/July. An average litter has 3 babies but as many as 9 may be born. The mother suckles the naked, blind young every three or four hours for several weeks. They gradually grow fur, their eyes open and at about seven weeks old they follow their mother out on to the branches. Gradually they start to eat solid food and when their teeth are fully grown, at 10 weeks, they give up suckling. A month or so later they move away from the nest to build dreys of their own. If there are not too many squirrels in the area, the young stay nearby; if it is crowded they will be chased away to look for less crowded feeding areas. Grey squirrels breed for the first time at a year old. Humans are the main predators of grey squirrels in Britain. Since intentionally releasing them into the countryside in the 19th Century they have spread and flourished and now we are trying to control their numbers. As an invasive species these squirrels, although cute and cuddly, are causing many problems to other animals, trees, birds and humans! The three greatest impacts of the grey squirrel to UK wildlife are to native red squirrels, trees, and many of our woodland birds. Grey squirrels seem much stronger and more adaptable than our native red squirrels and have taken over many of its former territories. This is partly because grey squirrels carry the squirrelpox virus, which is relatively harmless to greys, but which can kill red squirrels. Also, the greys' larger size makes them the obvious winners in any physical confrontation with red squirrels. Foresters, gamekeepers, park keepers and many conservationists regard grey squirrels as pests, mainly because they damage trees. Young saplings (sometimes rare species) are destroyed and they gnaw the bark of hardwood trees, such as beech and sycamore, to get at the nutritious sapwood below. The raw scar left on the trunk encourages fungal attack and may lead to distorted growth. There is growing evidence that grey squirrels are affecting native woodland bird populations. It is thought that these foreigners are affecting birds in three ways. Firstly by eating eggs and baby birds from the open nests of birds such as thrushes and finches and discouraging birds from using nest boxes. Secondly, squirrels use ideal nesting spots that would usually be occupied by birds such as the tawny owl, kestrel, jackdaw, stock dove and starling. 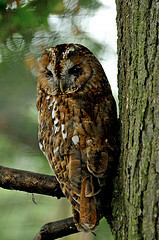 In some areas it has been reported that squirrels can halt the breeding of tawny owls altogether by taking up these useful nesting sites. Thirdly, they eat the same food! Squirrels have been seen taking a bird's store of winter foods and their diet means that they are in direct competition with other birds such as the nuthatch, hawfinch and bullfinch. 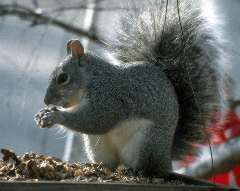 In many forest areas, the grey squirrel population is controlled by trapping and shooting. Gamekeepers shoot the squirrels on private estates. It is illegal to keep, import and release grey squirrels in Britain, unless you have a special licence from the Ministry of Agriculture or Secretary of State for Scotland. The Forestry Commission and National Trust also trap and shoot grey squirrels and sometimes they put them on the menu! Squirrels were eaten a lot in the past and now they are coming back on the menu in some places including London's top restaurants. Although the grey squirrel is a pretty, appealing and entertaining little animal, it can be a great nuisance in a garden too, especially to a bird lover. It is very bold and soon learns to take food from bird tables and chew through baskets of peanuts. It will also destroy birds' nests to eat eggs and nestlings.